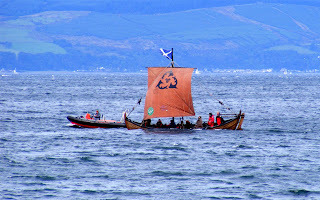 The "Vikings" appeared at Largs 06 September 2008. No wonder the RIB was in attendance, due to the available freeboard of this particular "longship". Methinks if this is an authentic copy, the Vikings could never have left a Fjord without swamping!